Click the images for further information and screen shots. Over 70 pages of printed reports on all Feng Shui information for you, your family, friends or clients and if you buy the Feng Shui consultancy business version you can even add your own name, company details, address, website etc along with a colour logo and with the master & business version these reports could grow to hundreds of pages personalised to you or your clients. Never before has this ever been available. 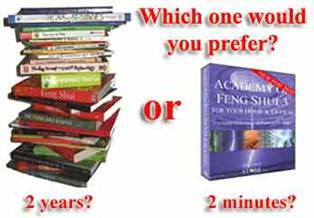 You would need to spend hundreds, even thousands of pounds/dollars for this amount of detail if you employed a professional Feng Shui consultant and if you decided to read the books it would take many years to learn all this information and then chances are the books or websites would be inaccurate and cause you many problems. This section is a very advanced formula that we have combined into the flying star chart to alert you when you have an auspicious or inauspicious flying star combination in your flying star chart for your property. It has eleven special combinations and formations like pearl string, locked prominent stars, menacing formations, fire burning heaven gate, inverse and hidden siren just to name a few and most importantly information on how to activate or cure them. The prosperity planner secret cheque uses an amazing secret formula based around your personal date of birth and Sheng chi lucky numbers and adds them to your very own personal printable cheque, you have probably seen something similar in “the secret” book or DVD, well this goes a lot further and also prints the cheque out for you as shown below. Just fill in your name, the amount you want, print it out and follow the precise instructions on where to place it. Is there any way to download your software? We lose a lot of mail here. We can provide a downloadable version if you would prefer this to post. We are happy to go ahead if we can download within days? It is for our own use so unless there are important features in the consultancy version we shall go with the master version. You mention 70 page reports in the pro version, does this apply to the master version also. You mention 100% safety in creating reports in the consultancy version – does this not apply to the master version? If it is for your own use, I would recommend going for the Master version. 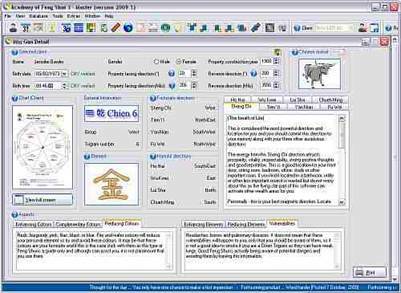 The Master and professional version still have 100% safety in creating reports; the only difference between these two and the Business version is that the Business version was designed to be used by Feng Shui or similar types Business and people deriving an income from the software by creating reports as you can incorporate your own logo and company details in to the reports with the Business version. The best way to purchase the software would be to follow this link and place an order. We will send you the web link to securely download the software shortly after and will also send you a physical copy. I am afraid that the software is only available in English at the moment. You may be able to get a translation add on somewhere online although I’m afraid we cant offer support for this. If you purchase the business version, All the texts in the reports can be edited in the reports but it would be up to you to translate it; you can also add your own logos and company details. Postage to columbia is £2.95 and is sent straight to a residential or business address. When will the consultant 2013 version be ready? I think I shoyld wait for the new version since it is almost &700 USA. 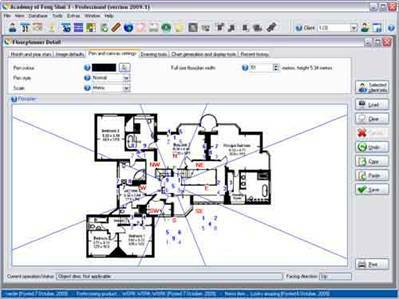 If you were to buy the consultant version, all updates of our software are free for the next 12 years. Please let me know if you have any other questions and I’ll be happy to answer. I also hope the software would help give solutions/ recommendation on the cures ? when will this software be upgraded for Windows 8.0? We are working on a windows 8 version at the moment. If you like, I can add your email to our mailing list. I have a Vaio laptop that is running on Windows 8. I have seen that the software is not compatible with Windows 8. I would like to know if there is any development happening with the Windows 8 upgrade and maybe a rough release date. Also, I would like to know about the price and details of email residential consultation. We live in India. 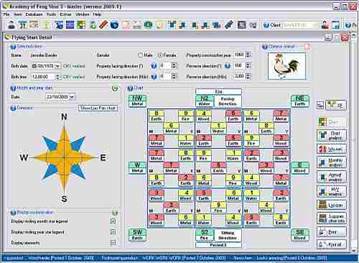 We have now found a solution to windows 8 working with the Academy of Feng Shui software and the software now works on that version. I’m afraid we do not currently offer remote consultations and only on site at the moment. I hope this answers your questions, Laxman. Como puedo tomar cursos de Feng Shui en San Antonio Texas?? estoy interesada o por este medio si puedo recibir algun curso en linea . Estoy afriad no estamos ejecutando actualmente ningún curso , tanto en el sitio o en línea aunque puedo mantenerle informado si tiene un curso que viene en el futuro si te gusta ?